There is no lack of affordable, 15.6-inch laptops nowadays. Virtually every manufacturer has a wide selection of models in its range. Acer enriches the offer with a new model dubbed Extensa 2510. Our report reveals whether the Extensa can stick out from the masses of 15.6-inch models. All laptops within the below-500-Euros (~$656) price range are rivals of the Extensa - for example, the HP ProBook 455, Fujitsu Lifebook A544 or Lenovo ThinkPad Edge E545. The Extensa is shipped in a matte-black plastic casing. A very subtle brushed metal look is simulated on both the lid's back and wrist rest. 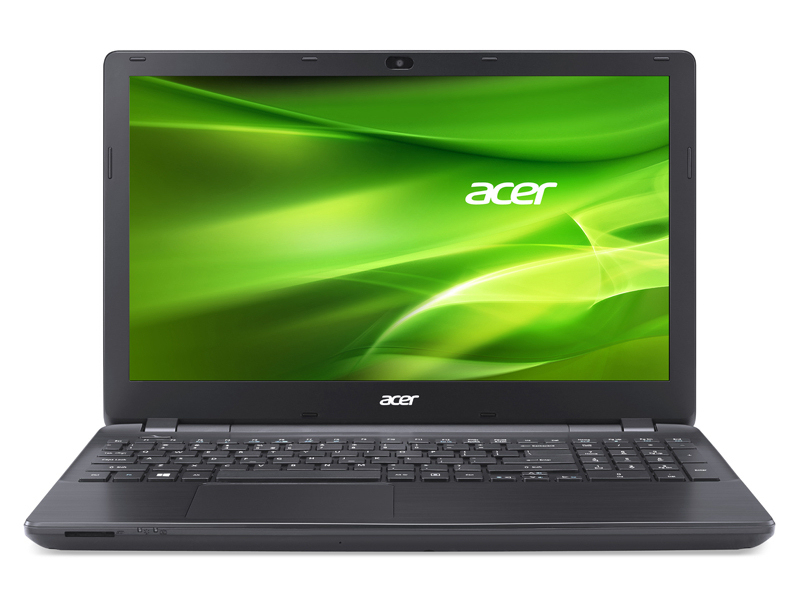 The Extensa cannot belie its relationship with the models from Acer's Aspire E1-5x2 line (Acer Aspire E1-532, Acer Aspire E1-572). However, differences are visible; for example, unlike the Aspire models, the Extensa does not have a maintenance cover. But, the Extensa can boast with a considerably higher-capacity battery (56 Wh vs. 37 Wh). The build and stability are absolutely satisfactory and reflect the price range. Only the common weaknesses that we find in many notebooks are discovered. The casing yields slightly beside the keyboard, and the base unit can be warped a bit too strongly for our taste. The type and placement of interfaces clearly show the relationship between the Extensa and Aspire once more. The Extensa supplies a variety of now common ports. It cannot stick out from the masses here. The Extensa is shipped with Windows 8.1 (64-bit) preloaded. There is no Windows DVD included. 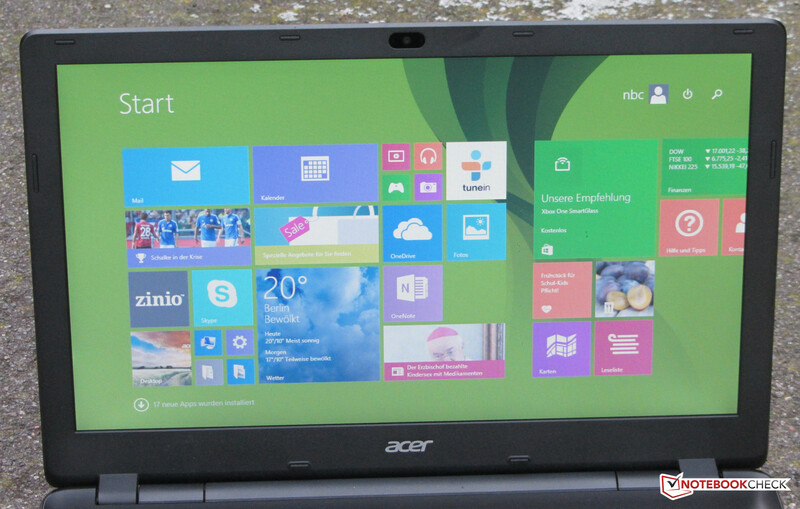 Acer only supports Windows 8.1. Users who want to install Windows 7 would have to obtain the drivers on their own. It's quite obvious: The lid's back is very susceptible to fingerprints. Left: Kensington lock slot, VGA-out, Gigabit Ethernet, HDMI, USB 3.0, combo audio. Right: 2x USB 2.0, DVD burner, power socket. The memory card reader is found on the front. The Extensa has an unlit chiclet keyboard. The level, slightly roughened keys feature a medium drop and a clear pressure point. The keys' resistance is also agreeable. The keyboard yields marginally when typing on it, but that did not prove distracting. Overall, the keyboard left us with the impression of a good typing feel and will also be suitable for prolific typists. The multi-touch capable ClickPad has a surface area of 10.6 x 7.8 cm, and thus multi-touch gestures are no problem. The pad's sleek surface allows the fingers to glide smoothly. The mouse keys feature a short drop and a clearly audible and palpable pressure point. The matte, 15.6-inch screen in the Extensa operates with a resolution of 1366x768 pixels. Unfortunately, Acer installs a dark model. A brightness of 183 cd/m² is absolutely obsolete. The same is true for the contrast of 271:1 and black level of 0.7 cd/m². The screen does not convince subjectively either. It produces a pale image and lacks brilliance. The color reproduction corresponds to what we expect from a laptop of this price range. The screen delivers a DeltaE 2000 shift of 10.18 in state of delivery. A rate less than three would be ideal. The screen also has a visible bluish cast. A simple TN screen has found its way into the Extensa. Consequently, the laptop can only provide limited viewing angles. Outdoor use is quite possible, but overly bright surroundings should be avoided due to the screen's low brightness. 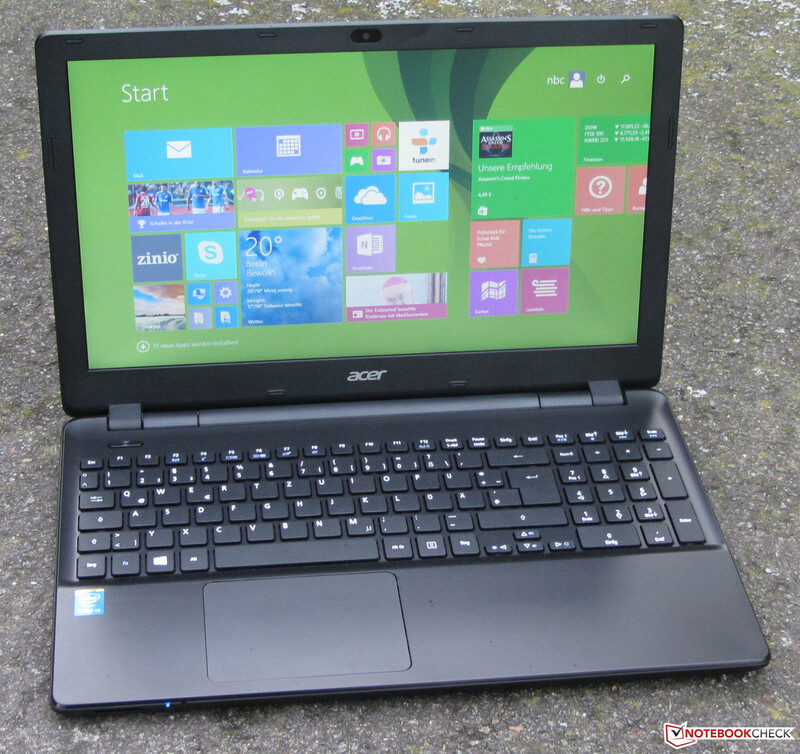 With the Extensa, Acer offers a basic 15.6-inch office laptop. It provides enough computing power for everyday tasks. Owing to the fairly high-capacity battery, it achieves better runtimes than we know from this price range. Our review sample is available for around 410 Euros (~$538). The price is about 330 Euros (~$433) without a Windows operating system. 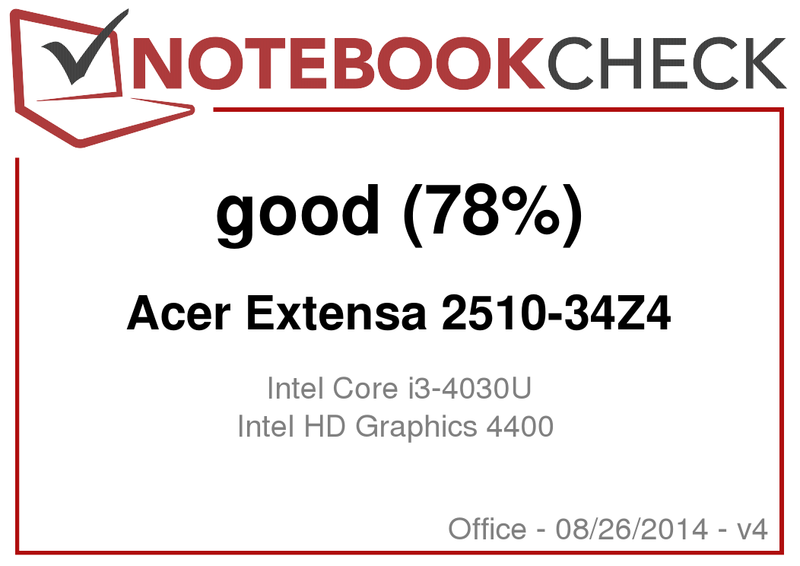 The Extensa is equipped with a Core i3-4030U. This dual-core processor (Haswell architecture) operates with a speed of 1.9 GHz. It does not feature a Turbo. The processor supports Hyper-Threading (two threads per core can be processed). Intel specifies a TDP of 15 watt for the CPU. Comparably priced laptops with standard processors (no ULV) usually calculate faster because their CPUs operate with higher speeds. For example, this is true for the Lenovo G510 with a Core i5-4200M processor. The full performance of the Extensa's CPU is available in both AC and battery modes. The processor always performed the CPU tests of the Cinebench benchmarks with 1.9 GHz. The system did not reveal any surprises. It ran smoothly, and no problems occurred. The good PCMark benchmark scores complement that. The hard drive installed in the Extensa comes from Western Digital. It has a capacity of 500 GB and spins with 5400 revolutions per minute. Overall, the drive offers good transfer rates. The scores achieved in the 4k read/write tests were noted positively. We rarely encounter such rates in conventional hard drives. Intel's HD Graphics 4400 core is responsible for video output. It supports DirectX 11.1 and operates with speeds ranging from 200 to 1000 MHz. The 3DMark benchmarks scores are within an absolutely acceptable field. The CPU-GPU array in the Extensa manages to render a few games in a low resolution and a low quality level. Games like FIFA 14 and Counter Strike: Global Offensive only place low requirements on the hardware, and thus also run in higher resolutions and with higher quality settings. Buyers looking for an affordable, gaming-suitable laptop should look at Acer's Aspire E1-572G (Core i5-4200U, Radeon HD 8750M). The laptop costs approximately 470 Euros, ~$617 (400 Euros, ~$525, without a Windows operating system). As appropriate for an office machine, the Extensa operates very quietly. The fan is often inactive in idle mode, and at most only the hard drive's noise is audible. The fan barely speeds up during load; we measured a noise level of 33.2 dB(A) in the stress test. The Extensa in the stress test. The Extensa not only operates quietly, it barely heats up as well. The surface temperatures ranged below 30 °C in idle mode. Only a moderate increase was observed during the stress test. The CPU and GPU performed the stress test (Prime95 and Furmark run for at least one hour) and exhibited the same behavior in both AC and battery mode. The processor clocked with 1.2 to 1.3 GHz while the GPU operated with 850 - 900 MHz. 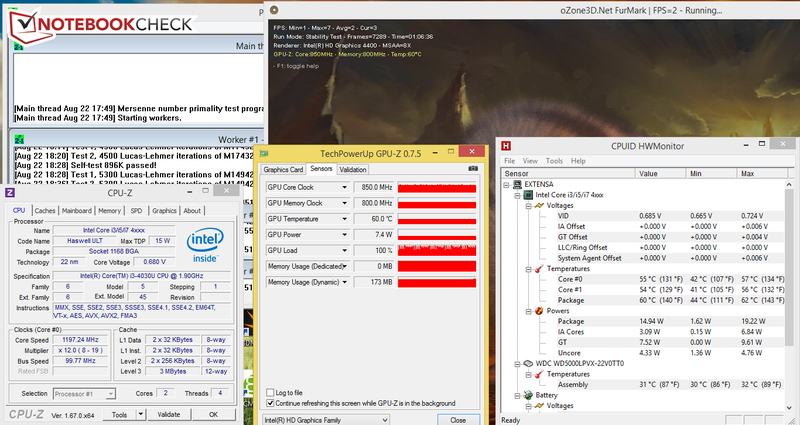 The CPU and GPU only achieved their full speeds in the first minute of the stress test. The CPU's temperature settled to roughly 60 °C during the stress test. The Extensa's stereo speakers are located on the casing's underside. They produce a rich sound that even allows agreeable listening for a longer time. We have had to listen to considerably worse speakers. The installed ULV processor ensures a low power requirement over the entire load range. The power consumption consistently remained below 10 watts in idle mode. That's what we're used to from Haswell laptops. Websites are opened automatically every 40 seconds using a screen brightness of approx. 150 cd/m² in the practical Wi-Fi test. The Extensa achieves a runtime of 6:31 h here. Owing to its bigger battery, the Extensa lasts considerably longer than its sister models from the Aspire E1 line, for example, the Aspire E1-532 (4:30 h) or Aspire E1-572G (4:26 h). We did not expect much considering the purchase price of around 410 to 430 Euros (~$538 to ~$564). However, Acer's Extensa is not disappointing. 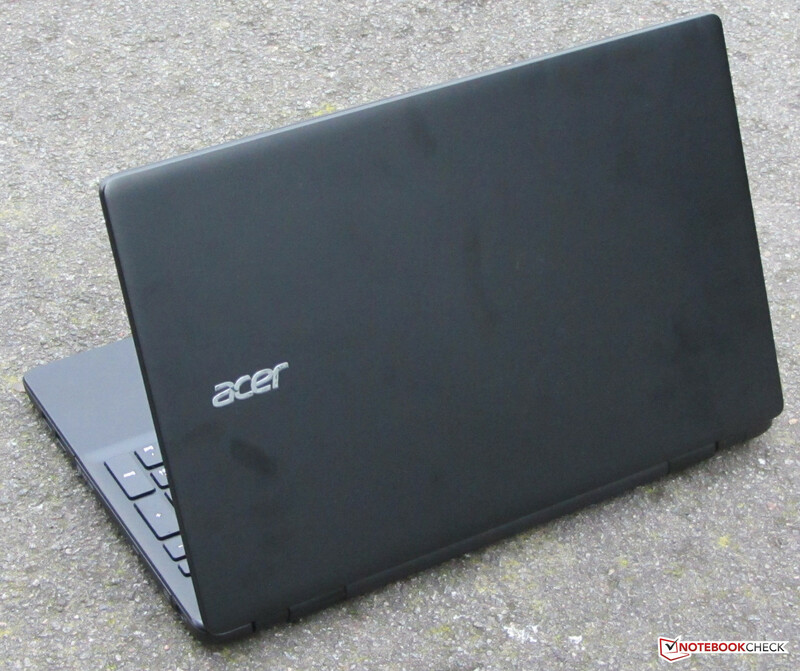 Acer provides an office machine for the tight budget with this device. 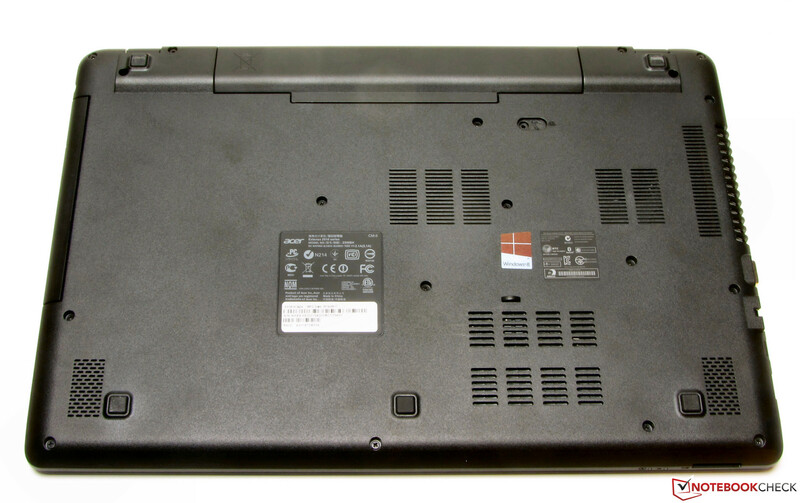 The laptop operates quietly, barely heats up, and it offers long battery runtimes. Good input devices complement that. Unfortunately, Acer has axed the maintenance cover. The Extensa's price level is noticed in the laptop's screen. Acer installs a dark, low-contrast model that exhibits a bluish cast. Acer could have increased the already good impression of the Extensa even more with a better screen. 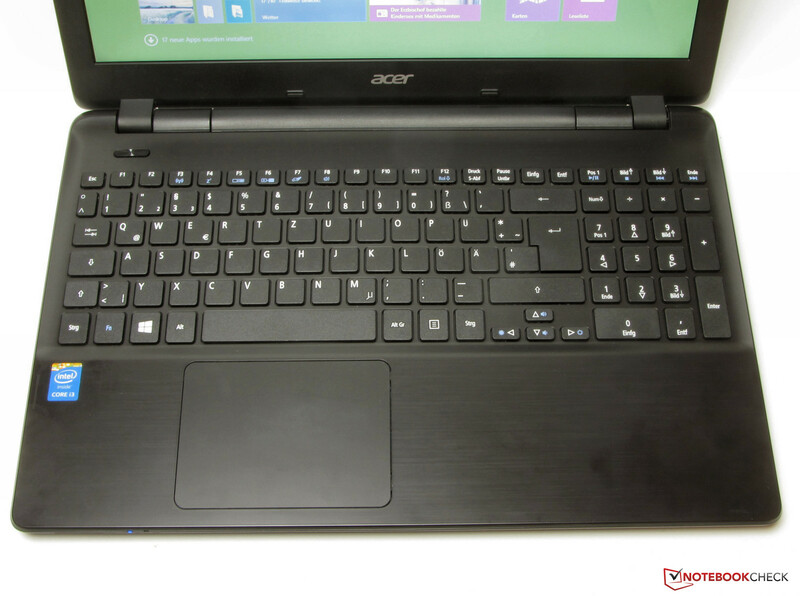 In review: Acer Extensa 2510-34Z4. Test model courtesy of Cyberport.de. The low emission rates and the good battery runtimes. A better screen and a maintenance cover. We rarely encounter long battery runtimes in the low-budget sector. Asus P550CA-XO522G, HP ProBook 455, HP 255 G2, HP 250 G2, Lenovo ThinkPad Edge E545-20B2000PGE, Fujitsu LifeBook A544, HP Compaq 15-a024sg, Packard Bell EasyNote TE69HW-29574G50Mnsk, Lenovo G510.